Look, I don’t care about the NBA, but I do like puzzles and thinking about ways to modify incentives. Tanking in professional basketball seems to be a problem. At least the league’s commission says so. I can understand why a fan would care who paid good money for tickets — even for one game — and your team’s management doesn’t really give a flip if it wins or loses because it wants to boost the club’s draft position. The more you lose, the lower in the standings you finish, the more likely you are to get a top draft pick who could transform your franchise. The NBA has tried to minimize the chances of tanking by manipulating the draft, setting up a lottery and altering the chances the worst teams would get the top picks. That hasn’t worked as well as expected. Some analysts suggest penalizing the bottom club by automatically giving it a lower position in the draft — say, with 16 teams making the playoffs, the team with the worst regular season record would get the 17th pick in the draft rather than the first. That’s too timid. For one thing, the teams finishing near the bottom would try hard enough to finish 28th or 29th rather than 30th, defeating the intent of the change. Let’s get bold. My plan is inspired by the NCAA tournament’s First Four, a way to get teams that probably don’t belong in the tournament a chance to play their way in. There are 30 NBA franchises. At the end of the regular season, all 30 are ranked based on the number of regular season wins. The top 12 teams automatically get a one-round bye in the playoffs. Teams 29 and 30 would get the 13th and 14th draft picks (respectively) in the first round of the draft. They would get picks one and two respectively in the second round. Those four winners would advance to the first round of playoff games, becoming seeds 13-16. The remaining 16 teams would be reseeded. The conference they played in during the regular season wouldn’t matter. The first round may be best-of-five or best-of-seven. I don’t really care. The 16 teams in the play-in rounds get another incentive to win: During the draft lottery, each win would get the team an extra “ball,” or an additional chance to move up in the draft. So if team 21 makes it to the traditional playoffs, it’ll have a better chance of getting a top pick than a team than, say, team 28 if if lost its play-in game. Bad teams will have bad records. But every team at the bottom half of the league would have an incentive not to lose. Long time, no post/ plus, RUJ Christmas book! Hi there! I’ve let this blog go dormant because … life. I’ll try to reanimate it. 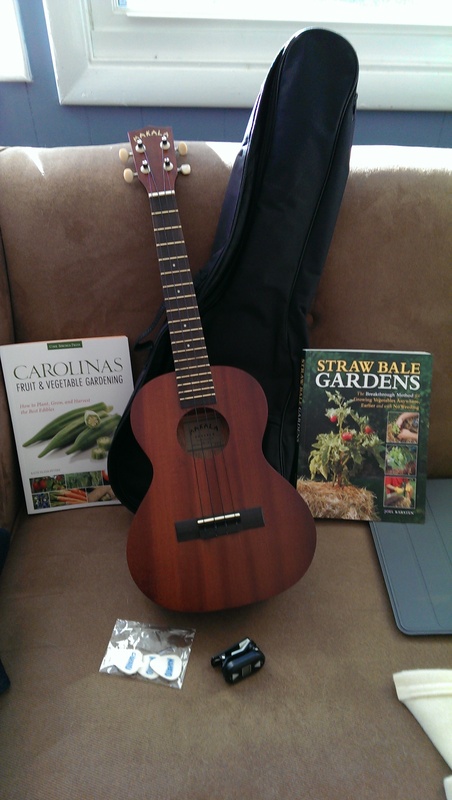 Meantime, for those of you in the Raleigh Uke Jam, I’ve attached a PDF of our Christmas book. We’re rehearsing at 7 p.m., November 30 at the church. If you want to practice beforehand, just download the PDF at the link below and go to town. Happy Thanksgiving to all and see you at Pelagic on the 28th! 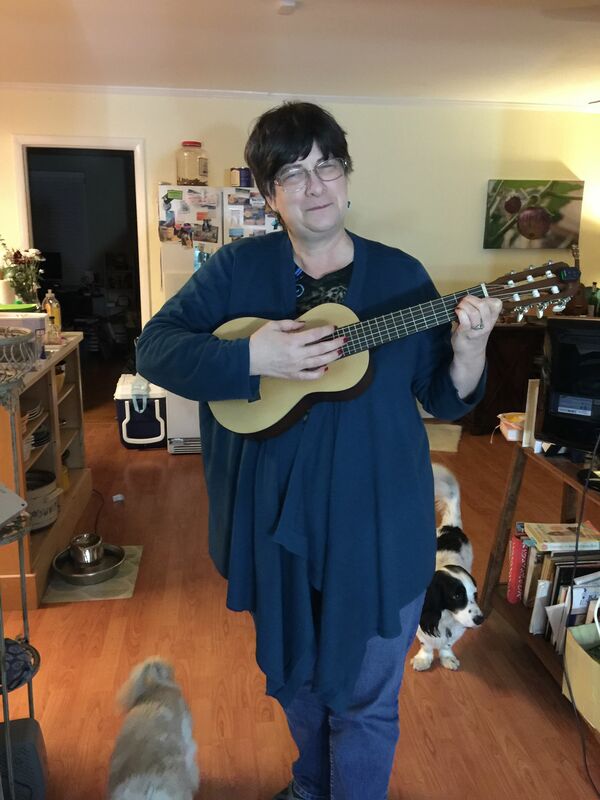 In ukulele circles, arguments over string preferences get mighty personal, not quite as feisty as debates over barbecue (eastern vs. western N.C., Texas vs. Memphis, etc. ), but still quite heated. The Italian string-maker Aquila seems to have cornered the market on decent mass-produced strings, but I’m not a big fan of their “nylgut” formulations, intended to offer the durability of nylon and the precise tone of gut. I’ve found them to be muddy sounding and more rigid than I like. But, as Barry (“Baz”) at gotaukulele.com points out, fluorocarbon also is used to make fishing line, which is a lot cheaper than the $1 per foot you pay for a comparable precut uke string. Barry also thinks a lot of strings really are fishing line, cut into roughly two-foot pieces and packaged individually. Is there a difference in sound or playability? Barry did his own test (comparing my favorites(! ), Worth Browns, vs. Seaguar fishing line), and I couldn’t resist conducting my own. Here’s the deal: I bought 25-yard spools of Seaguar Blue Label fishing line at the break points (tensions) Barry recommended. I used my soprano Flea, played the same songs — Six Days on the Road, Roly Poly (Bob Wills), and Sunny Afternoon (the Kinks) — with Worths and the fishing line, giving the Seaguar time to settle after making the switch. Judge for yourselves. The four spools of fishing line cost slightly less than $90 on Amazon and they will make between 35 and 40 sets of strings. All you need is a yardstick, scissors, and a little patience. 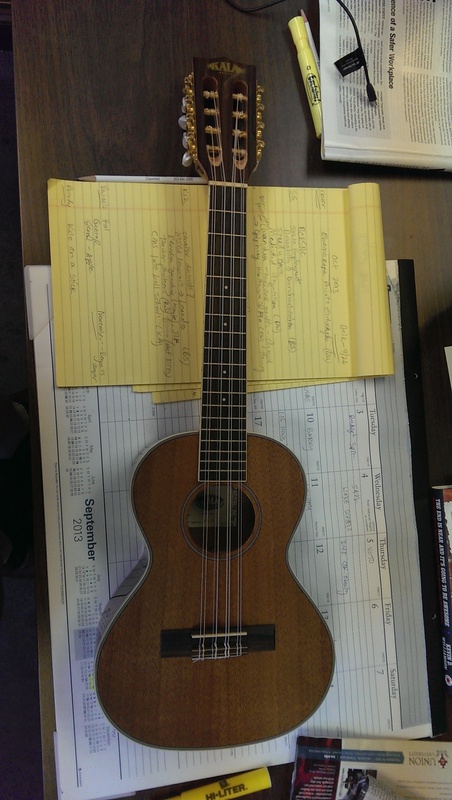 UPDATE: Many uke players prefer “wound” strings — strings that have a core of the basic material but are wound with a filament of steel or nickel. You’ll usually find them on instruments with longer scales (tenor, baritone). This allows the string to maintain tension without making the diameter of the string ridiculous (think coathangers). I tend not to play tenors and never have played a baritone, so I stick with unwound strings. The other issue with wound strings is that they are much brighter than unwound ones, so if your set is mixed, the instrument could lack balance (the G or C could be much louder than the E or A). 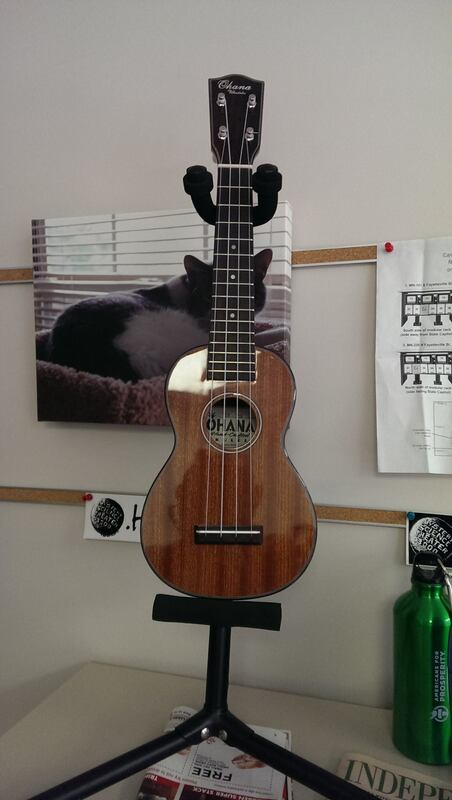 I’ve owned (or at least had in my possession) 11 ukuleles since September 2013. He–eee—eee–re they are! Ohana TK-70G, solid spruce top, laminate maple back and sides. Oh, baby, did this feel and sound sweet. Mim noted that it looks a bit like something a televangelist would play, but no matter. It was the one for me. And, as it turns out, it’s been my only keeper. (More on that later.) Fretting wasn’t as much of an issue as it is on the KA-8, and the spruce top projects like crazy. Plus, I bought a second hard shell case. Summer got here. 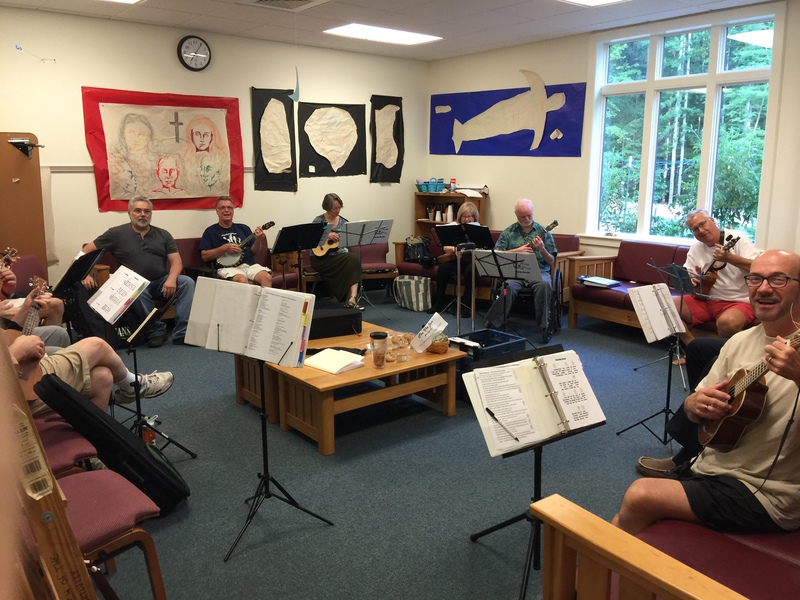 I began going to the twice-monthly meetings of the North Raleigh Uke Jam (and now I help out with the Facebook page). Highly recommended. It has improved my playing and singing significantly and hooked me up with some wonderful people. I’ll probably write about it often. With summer, came UAS. I subscribed to Ukulele Magazine (naturally), and in it read a positive review of the Eddy Finn line of ukes, designed in Michigan and manufactured in Asia. 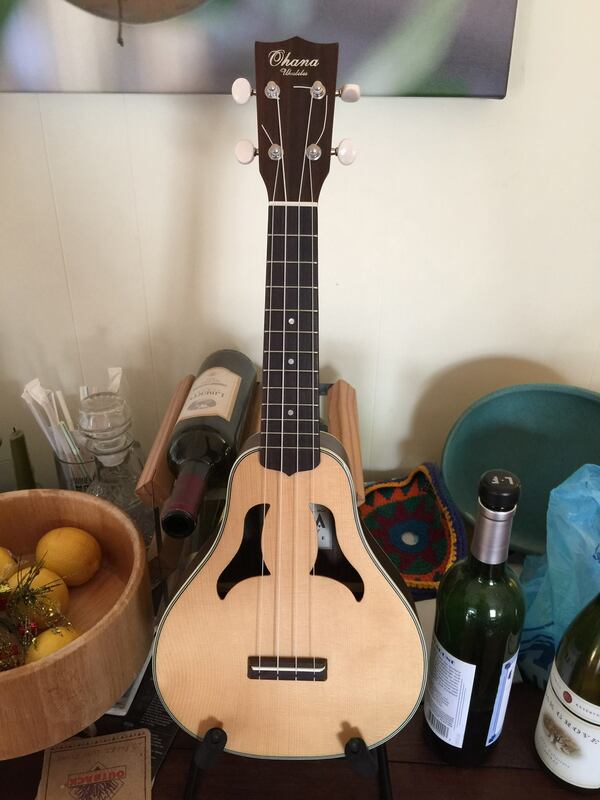 (Note the shark fin-shaped sound hole.) 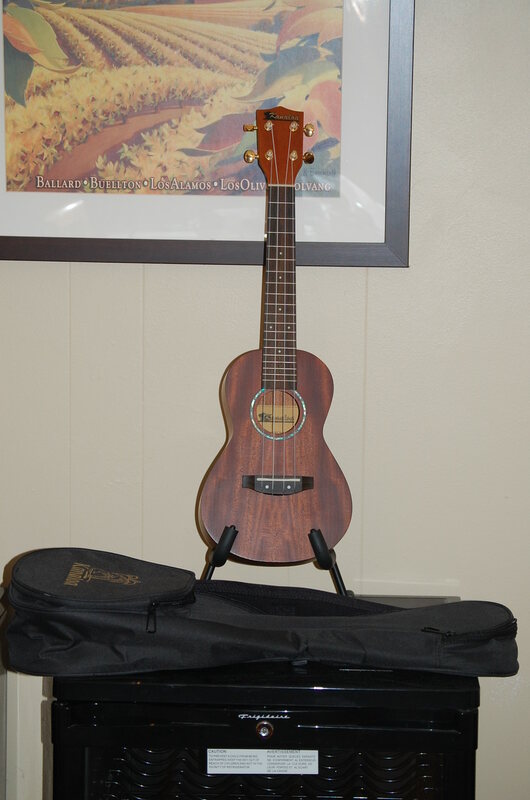 I found a concert-scale laminate mahogany model on eBay that I bought for $50, including shipping. It’s a pretty instrument, and it played OK. It was worth the gamble. So that became part of the stable. And it was time, as they say, to start thinning the herd. 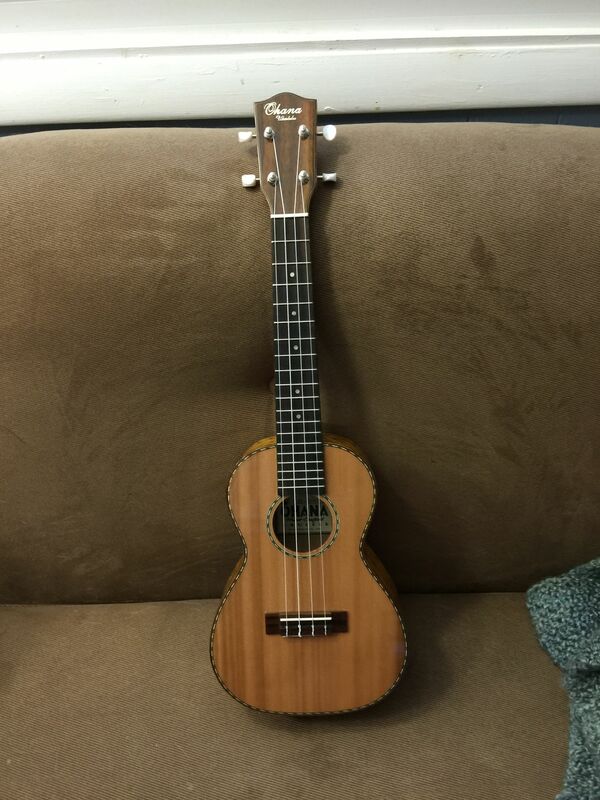 On eBay, I sold the Mitchell and the Kanaloa, leaving me with the Kala, Mahalo, Ohana, and Eddy Finn. Then on Facebook, I learned that a music shop had opened at the weekly Flea Market situated at the North Carolina State Fairgrounds. 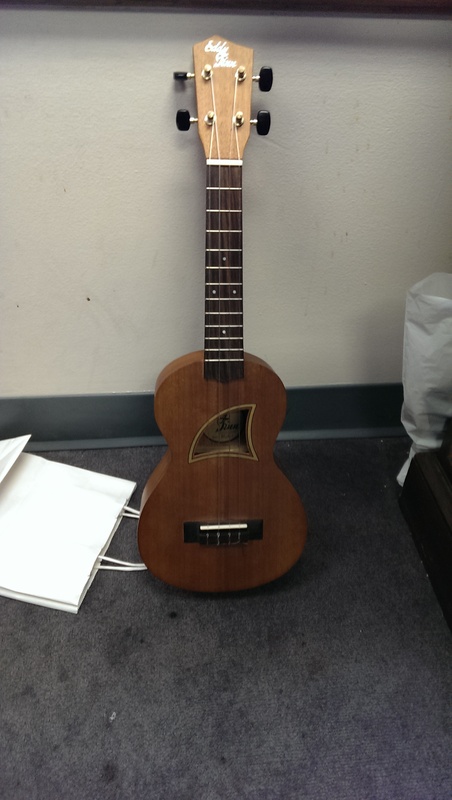 Charles, the owner, posted that he sold ukes, including Ohanas and products from The Magic Fluke Company in Massachusetts. Learn more here. 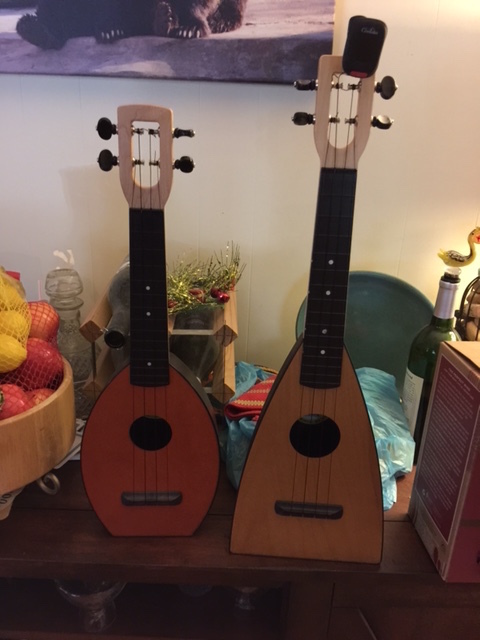 I had read a lot about the Flukes and Fleas, and when he told me he would give NR Uke Jammers a discount, I left happily with a soprano-scale Flea and a Flea bag. Terrific purchase. This puppy winds up being played almost daily. The hits just keep on coming. 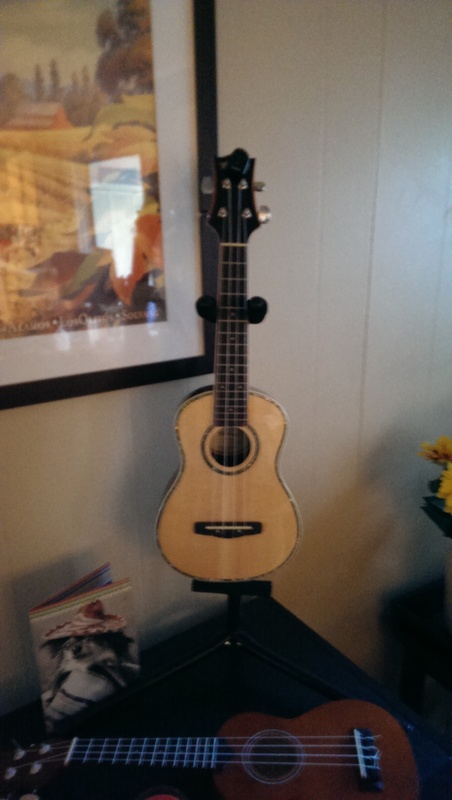 In early October, I broke down and made another purchase from Mim, this time an Ohana solid mahogany soprano with a gloss finish. This guy gets played as much as the Flea. 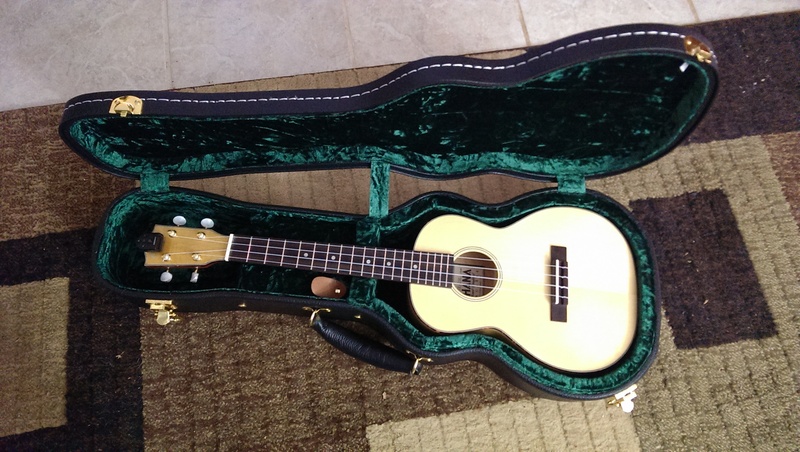 It has the classic uke sound, with more sustain and depth than most. Friction tuners, beautiful binding and purfling, for the money I don’t think you can do better. But wait. There’s more. December was a veritable acquisition spree. 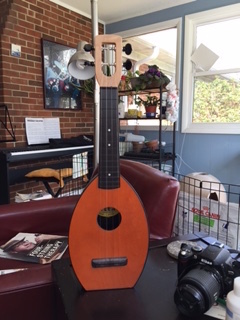 I had read about the Vita ukuleles made by Ohana (and others) modeled after the Vita instruments designed for uke wizard Roy Smeck in the 1920s. The Vitas have f-holes like mandolins and project like crazy. As I learned more about the Ohanas and the price point (less than $200), I started looking for used ones online. I found one listed at the UU Marketplace, made an offer, and had me a new-ish Ohana Vita. 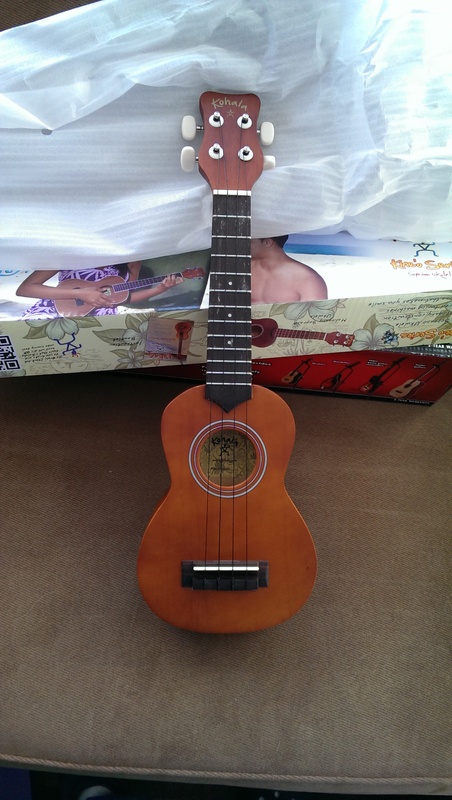 This, by far, is the loudest uke I own. It’s also one of the more playable ones. Then, what with Christmas coming and all, I decided to include the lovely and talented Cara in the ensemble. I gave her a Cordoba Guilele (6-string instrument that’s the size of a parlor guitar or a tenor uke tuned like a guitar) for Christmas. It’s actually a pretty cool instrument that she picks up every now and then (when she’s not knitting, which she prefers to do). We’ll perform together sometime. The guilele is a fun instrument to have around. Also in January, for my birthday, Cara gave me a beginner’s harmonica set and a very sturdy rack. I don’t practice nearly often enough and need to do more. Now thinned, it was time to restock the herd. In February, I went back to Mim, this time for a concert scale Ohana. Solid cedar top, laminate willow back and sides. It’s a genuine looker and a wonderful player as well. Ab-so-freakin-lutely gorgeous. She also had a very slightly dinged hard shell case at a good price, so I got both. This one could not be replaced for the money invested in it. I really love taking Willow to the jams. So I sent it back to Magic Fluke for repair. I told them I wasn’t the original owner, the bridge had been altered, and I was happy to pay for a repair/replacement. They told me they usually charge only return shipping charges for repairs. Wow. So I sent it to Massachusetts with a check for the shipping, and within two weeks, it was back to me with a brand new bridge/saddle and a new set of strings. The folks who run Magic Fluke defy description. They’re the best. Buy something from them and tell your friends. For now, UAS is in remission. (Don’t talk to me about String Acquisition Syndrome, a real issue when you’re using something other than steel strings.) It may hold on for awhile. But having four Ohanas (mahogany soprano, Vita, cedar/willow concert, spruce/maple tenor) and two Flukes (soprano Flea, concert Fluke) works very well. Sound clips of each to follow. Thanks for your patience.